The pseudonym of Harry C. Crosby Jr., “Christopher Anvil” was one of my favorite authors in the days I was reading Astounding Science Fiction a long time ago. I’m talking about when John Campbell edited it, and before it became Analog, though Anvil stories appeared after the name change. That’s where I read “Pandora’s Planet” in 1956, and I was hooked. Baen published Pandora’s Legions in 2002 which contains “Pandora’s Planet” and the rest of the Centra series. Then in September 2004 came the first of these two collections. Interstellar Patrol collects 14 stories, the first half of Anvil’s Colonization series of stories. Those stories were originally published in random order, but editor Eric Flint did a nice job of putting them into a fairly coherent saga. In 2007 came the second, massive, volume Interstellar Patrol II, with 23 stories, the rest of the Colonization series of stories. John Clute in his excellent Encyclopedia of Science Fiction describes Anvil’s work as “archaic, simplistic and insistently readable”. For me these are a “guilty pleasure” of good old science fiction enjoyment. These are books to read in a gleeful swoop. Anvil’s sense of the absurd, his ability to twist logic and invest his characters with simultaneous strength and frailty makes the people and organizations in these stories a delight. 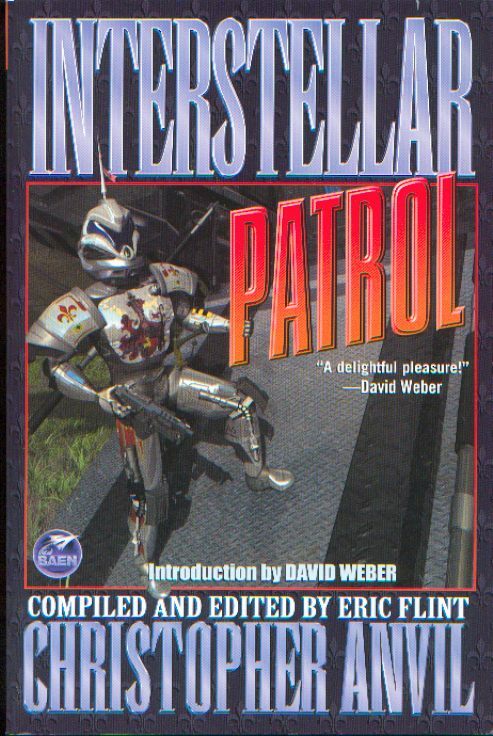 These Interstellar Patrol stories include several first contact tales that are hilarious and thought provoking. If anyone has wondered if there is a place in science fiction for humor, irony and fun in science fiction, I believe the answer – yes – lies in the stories collected in these volumes, and in the rest of Anvil’s work. I liked these a lot. I started reading the SF magazines about 1961 when I was thirteen. I remember reading a lot of Anvil’s stories then and enjoying them but have never read any since. He was my second favorite Analog writer at the time. The first was James H. Schmitz. You have good taste, Steve. These are good, entertaining stories. I just started reading Anvil a year or so ago, I started with Strangers in Paradise and continued by reading his stories in a friend’s old Astounding magazines. I have since finished Pandora’s Legions which I enjoyed. Anvil and Schmitz are two of the writers I quite liked from those magazines. I just finished Schmitz’s Lion Loose tonight, as Clute said Anvil is insistently readable and I find Schmitz is as well. Slight but fun old fashioned SF adventures. The ebooks by Eric Flint are a nice way to read both authors. I found these collections to be very good and a lot of fun. Good old science fiction! This author is new to me. These books seem to be easy to find at reasonable prices online, I will put them on my list to look for. Or would you recommend I try something else of his first? I am assuming that the stories are longish if there are 14 stories in nearly 600 pages in the first one. I like longer short stories. These are a good place to start with Anvil, Tracy. 884 pages! That is George Kelley territory. Great review of an author I was unfamiliar with. These do sound like fun. They ARE fun, Jeff. These collections are easy to slip in and out of, so the page count isn’t really that scary. I have the first on hold at the library. Hope you enjoy it, Jeff. When an Astounding came, if there was an Anvil story, I read it first. Kelly Freas illustrations added a lot, too. My “first reads” when I started regularly reading the fiction magazines (1978) were diverse, but certainly included Fritz Leiber, Robert Bloch, John Varley, Bill Pronzini, Barry Malzberg, Patricia Highsmith, Avram Davidson, Janet Fox, Kate Wilhelm, Grania Davis, Joanna Russ, Jane Yolen, Andrew Weiner, Harlan Ellison, Steven Utley, Jack Vance and Manly Wade Wellman…my early enthusiasm for Glen Cook and (Ms.) Sam Nicholson was slightly cooled after my first months (Cook was just beginning to write series that I thought less engaging than his one-offs, including an expert pastiche of Vance).